From Torpo in Hallingdal – Norway, about one thousand meters above sea level. Tagged Farget himmel, Hallingdal, Himmelbilde, Oppheimåsen, SkyWatch, Snørbilder, Solnedgang, Torpo, Vinter. Steike flott. Har du langfri du Rune? Sikkert mye hare der og. Og storfugl. Ser det rykker i avtrekkerfingern til far. Å hælle dussan!!! Take me there!!!! For et flott bilde, Rune! Skjønner at du vil tilbake, ja!! Fantastic shot! Gorgeous skies and colors! And it does look COLD, but beautiful nevertheless! That’s beautiful, Rune. I’m with Anne – take me there too! Great Sunset..it looks soooo cold there with the snow. I Hallingdal er det skikkelig vinter. Vinter, slik jeg liker det. Stabilt og fint! Snø og kalde, klare dager. Thank you for sharing this lovely view with Sky Watch Friday. The sky is painted such pretty colours and like seeing that little trail of footprints up the path. What a beautiful sunset! I love the snow. It looks so calm and silent! Hulk, snø… Dårlig med det her! Everything leads towards the sun – the gap in the fence, the trail of footprints in the snow. Lovely! Der kan du bare spenne på deg skiene og kameraet og kose deg ser jeg. Lite snø på Fosen, men håp om det til helga. Great winter shot. No snow here. What a lovely snow scene! Beautiful…excellent capture. Very nice landscape, with a lovely sunset. How nice to look at that sky, and the colors blend well with each other. That’s a beautiful and peaceful shot. 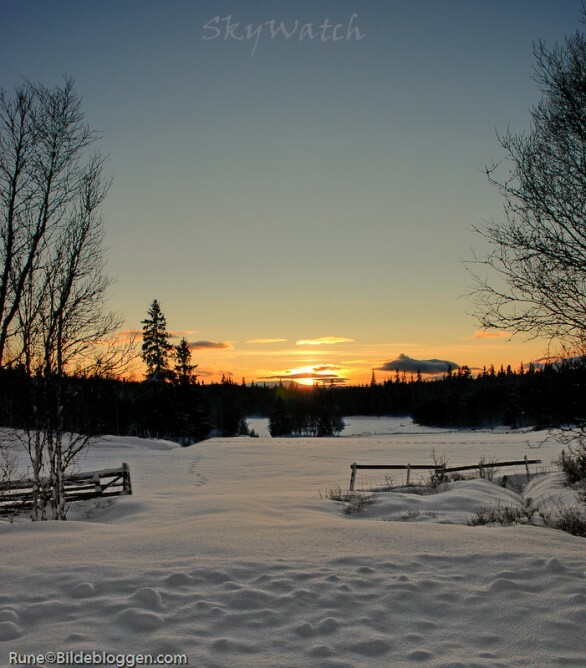 Awesome photo, the snowy field and the sun just look beautiful. Meget flott bilde av et flott vintermotiv. Nå vil jeg snart bytte bort regnet med snø slik at det blir litt lysere ute. Hmm…Sto i garasjen og så på fjellskiene i dag. Kommer ikke vinteren hit og snart tro? Urettferdig å vise sånne bilder…. Den som kunne vært der istedetfor å ha 4 grader å regn hele tiden. Great shot and beautiful blog. A beautiful shot, and I see that your winter has already set in. Det var et utrolig flott bilde: kombinasjonen av snø og det flotte lyset på himmelen, nydelig motiv også! Ja, der skulle man ha vøri – og ikke her nede i mørket og regnet! God helg! Otroligt vackert! Så underbart med den vita snön. Jag blir riktigt avundsjuk. This is such a great photo. It looks so peaceful there. Top of the world. That is a beautiful scene, so peaceful and calm. This is a gorgeous shot made beautiful by the snow. The sun setting beyond the horizon is captured and portrayed very well here. Already snow, or just in the mountians? When I had my first winter in Canada, it was so beautiful, but also so cold. Very serene and beautiful. I love the snow and the quietness it adds to the picture. Really a charming light in this very fine picture. Gorgeous photo. This is a Christmas card shot! Great scenery, love the compo, the magnificent colors, Done a great job!!! What a great winter scene. Vilket fantastiskt fint vinterfoto. jag hoppas attt vi får snö här snart också. En vit jul vore inte så dumt. Oändligt vackert, längtar till Norr och snö. Måste ringa brorsan i Luleå!! Rune: That is a beautiful scene with your snow covered land. Looks very, very cold there. Lovely skywatch post. amazing winter scene with sky! Nicely done, thanks for sharing. Photo could very easily be a postcard. We had our 1st snow in Ohio-USA today but nothing like yours. Djupt avundsjuk att du fått ett sådant där underbart foto med SNÖ! Herlig vinterlandskap. Fantastisk lys. Får lyst til å spenne på meg skiene når jeg ser slike bilder …. Lovely shot. The warm sunset colors contrast well with the cold white of the snow. Første gang jeg er her ! Nydelig vinterbilde du har lagt ut;) Takk for kommentaren og ha en flott adventshelg! Oh you did so well to stop by! I love your photos and your fairy tale country’s landscapes. I love your wonderful photo of lighthouse and snowscape. I’m honored to have you my Sky Watch. It’s quite a heartening comment for me. Vilken vacker bild! Vackert med snön och himlen och träden ramar in bilden så fint! Virkelig vakkert når været er slik som dette. Magical… I feel as if I’ve been touched by the divine… This is special.